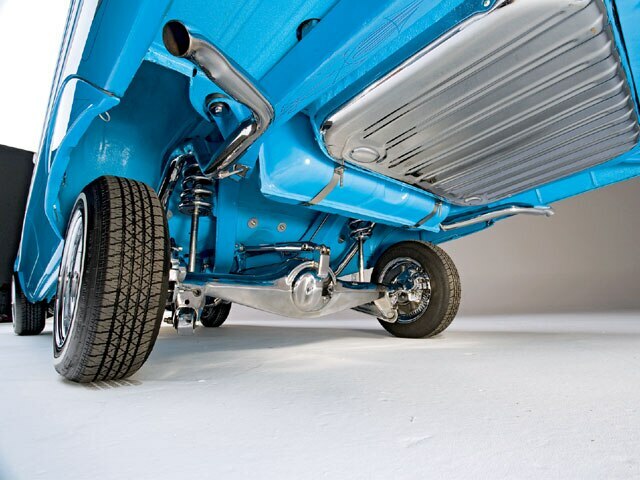 Big-Leaguer Jacque Jones Covered All The Bases When He Drove Home This Sweet '64 Ragtop. Anyone who’s read this magazine for any length of time knows that lowriders come from all walks of life. We’ve featured cars owned by lawyers, teachers, engineers, etc. as well as a number of professional athletes. Adding his name to that roster is slugging Major League baseball outfielder Jacque Jones, who just became a member of the Detroit Tigers during the off-season after multiple productive years with the Minnesota Twins and Chicago Cubs. 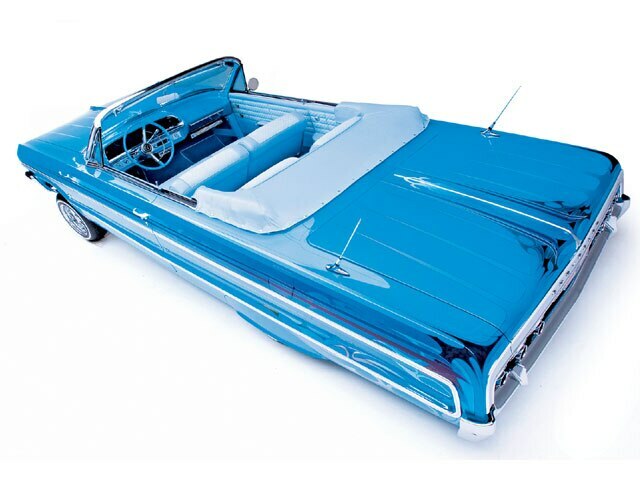 Growing up in san Diego, California, where he was three-sport star in high school before enrolling at the university of southern California, Jacques soaked up what he saw on the vibrant san Diego lowriding scene. Now that he’s a professional athlete, he can roll in any car he wants, but to his credit, Jacques decided to add a real lowrider to his collection. 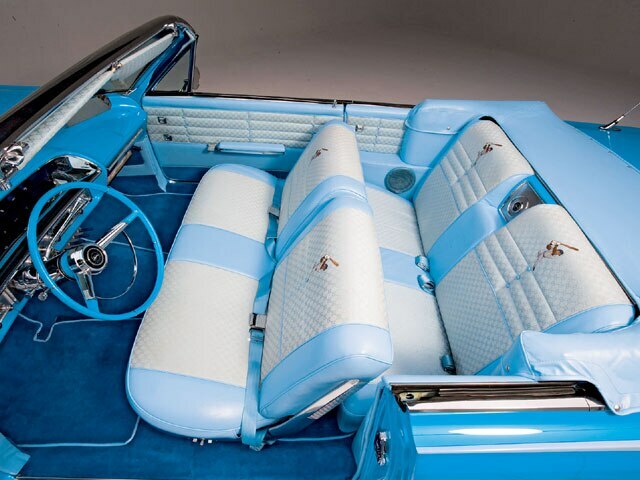 it’s no accident that Jacques calls his bombay blue ’64 Chevy impala convertible “Major League,” as he made sure that the car was of the finest professional quality in every respect. Since he’s busy swinging for the fences and shagging fly balls for much of the year, Jacques entrusted MarkTurner, the owner of Major League Restoration in san Diego, to manage the project for him. Jacques wanted a car that would be an all-star performer on the show floors as well as the bou levard, and Mark drove the project home for him. in fact, he hit a grand slam. “Jacque came to me and had a vision of what he wanted,” Mark remarks, “so we got together and made it happen with the help of my brother keith Dunn and my company, Major League Restoration.” Jacque’s more than willing to give Major League Restoration the fame, now that he has a ’64 with real game. 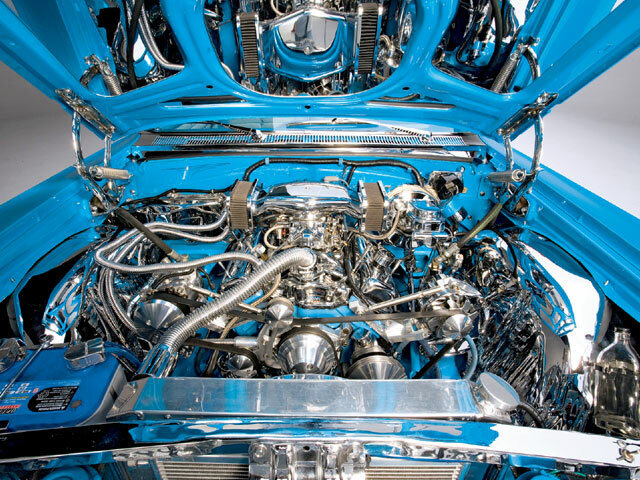 Engine/Drivetrain: Powering the ’64 is a 2005 Chevy 350-c.i.d. 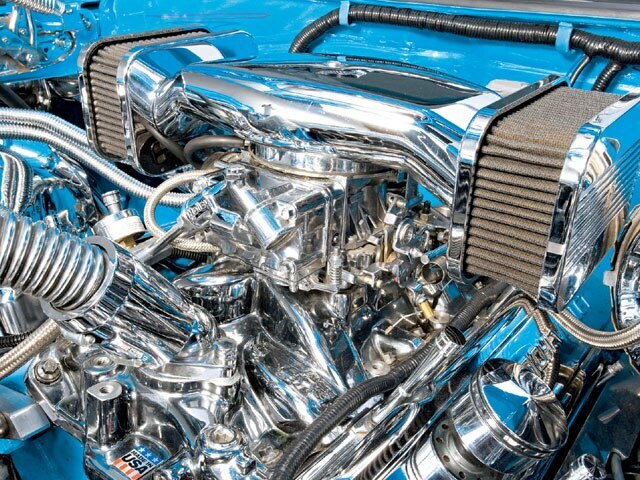 engine with electronic ignition, serpentine belt system, dual exhaust and plenty of chrome pieces, including a holley carburetor. Tony at southland Transmission in National City, California, managed all of the motor matters. 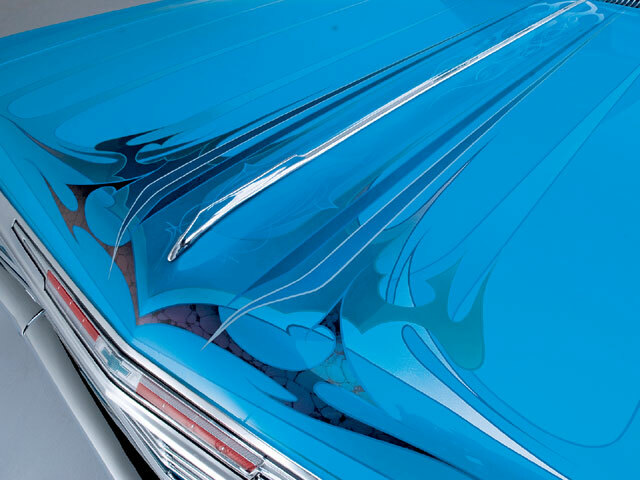 Body/Paint: benny Flores of san Diego applied the car’s two-stage bombay blue patterned paint job, before Manuel Cisneros was called in from the bullpen to finish the exterior with some precision pinstriping. 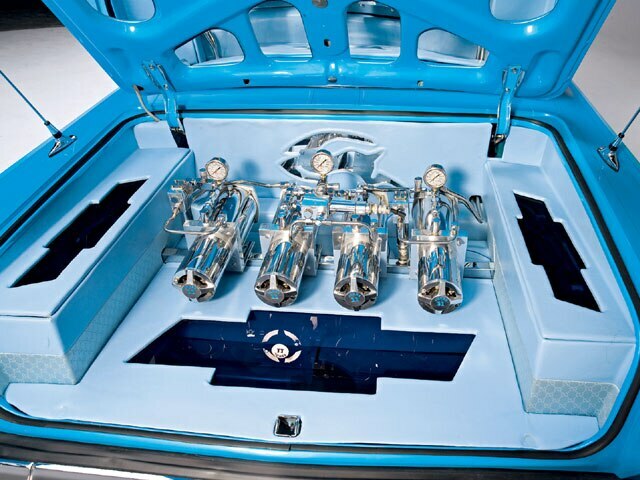 Vern’s Chrome Plating in Gardena, California, made sure that the impala came home with the chrome. 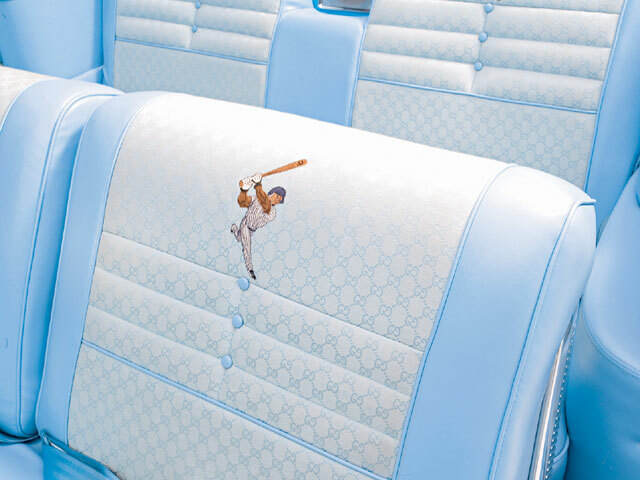 Interior: henry at Arroyo brothers upholstery in National City hit a home run with the car’s handstitched Gucci interior. Electric seats are among the modifications found inside. Sound System: When he’s not clearing the bases, Jacque likes to clear his head with some good music delivered over a premium sound system. Leading off the all-star audio lineup installed by “Gordo” at homies hydraulics in Paramount, California, is an Alpine head unit/CD changer, with two Rockford Fosgate amps, and an array of kicker speakers. 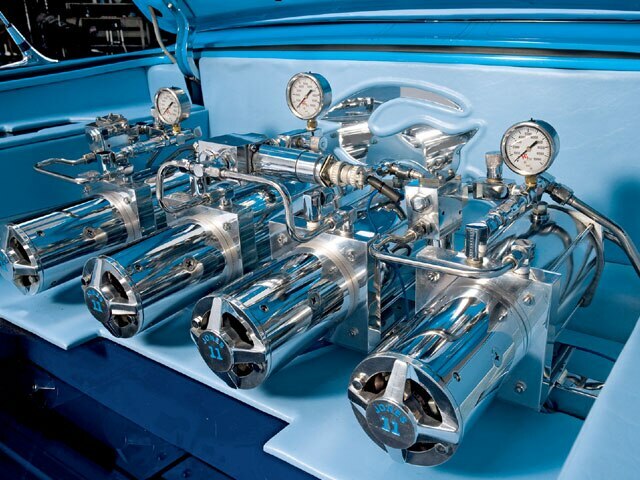 Setup: Anthony Fuentes at homies hydraulics pitched in with a fourpump hydro setup featuring three L.A. square dumps, 8-inch (front) and 14-inch (rear) cylinders, 16 solenoids, hi-Low performance blocks and 12 Centennial batteries.